This slugger is up at bat ready to show them how a real pro hits the ball out of the park. 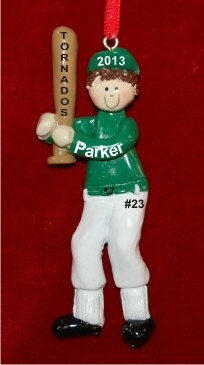 Personalize the baseball ornament with his name, the year, his team name, and optionally his number. The Baseball Male Green Uniform Brunette ornament measures 4"H, and arrives nestled in our black velvet pouch, ready to make a great gift.